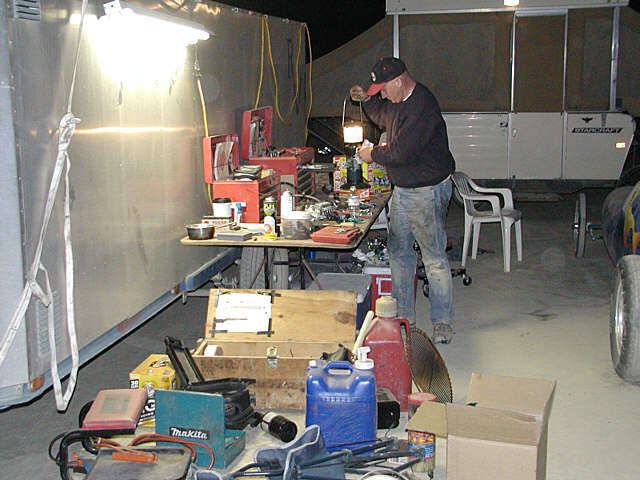 With a final two day meet at El Mirage, the racing season is over. With a high performance car like ours, maintenance is never ending. As an example, a few days before the race, I broke out my mother's old sewing machine and rebuilt the Pilot 'chute. Mark, James & I met Friday evening at the lake bed. Mark had already gotten the car inspected, but it still wasn't running right. Saturday morning James & I setup the timing equipment then I went back to help Mark with the car. We decided to pull the filters out of the injectors to be sure they were not clogged but it didn't seam to help. Since we were 11th overall going to the meet our first run we fairly early in the morning with Mark driving. He managed to get to 146 Mph but reported that the motor still was running like crap. When we got back to our pits we ran into the guys from Southwest Superbikes and a pile of spare parts to help us trouble shoot the motor. While deep into the throws of swapping out the electrical parts Wally Ross (our crew member form Bonneville) and his family stopped by our pits. It sounds like Wally may have caught the speed bug since he had sketches of and idea for a cool looking streamliner. Unfortunately we didn't have long enough time to talk since the second round was coming up and our electrical system was scattered all over the pits and were sill hadn't found the bug. Once we had swapped literally every component that could be swapped for a new one we zeroed in on the two sensors that are embedded inside the motor's case. We discovered that the crank position sensor measured good but was not putting out the correct signal. TO get to the sensor we had to cut out a piece of the body with a hack-saw blade. Once the motor was open the issues was obvious, the key that holds the crank position sensor flywheel aligned to the crank was broken and the flywheel was free to spin at will. 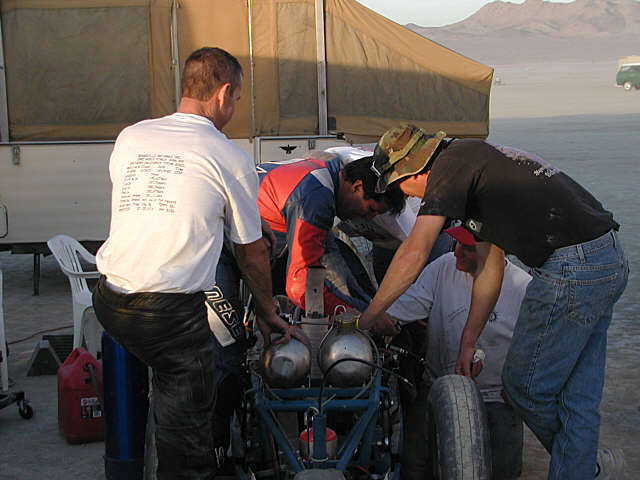 It is a amazing that the motor would even start and run at all let alone push the car up to 171 at Bonneville! We made a key out of 3 dimes and reassembled the flywheel. Before we were done, round two was underway so we had to hurry to get into line. This time I (Alan) was driving and the motor was screaming to go. Mark and Richard (from Southwest Superbikes) were in the push truck. When the pushed me off I was easy on the gas since the track was a little loose and the motor was running wickedly strong. When I shifted into second gear the motor let out a "bang" and stopped running. All I could think about as I turned off the track and into our pits was all the time and money put into getting it running right only to destroy it with out even completing a full power run. 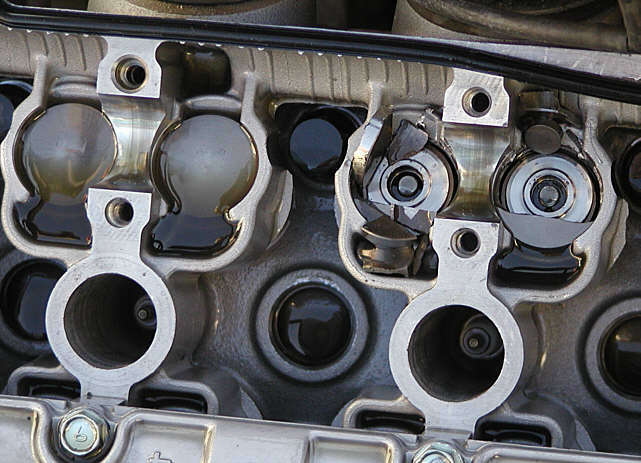 Without even looking we all guessed that the timing chain had broken which can cause mild to complete destruction of a motor. The guys from Southwest Superbikes help us check out the damage. We pulled off the cam cover and sure enough the timing chain was toast. additionally Two of the intake valve buckets were crushed but we needed to pull the head to find out if we still owned a motor or only a bunch of scrap aluminum. The crushed valve buckets, a very bad sign. 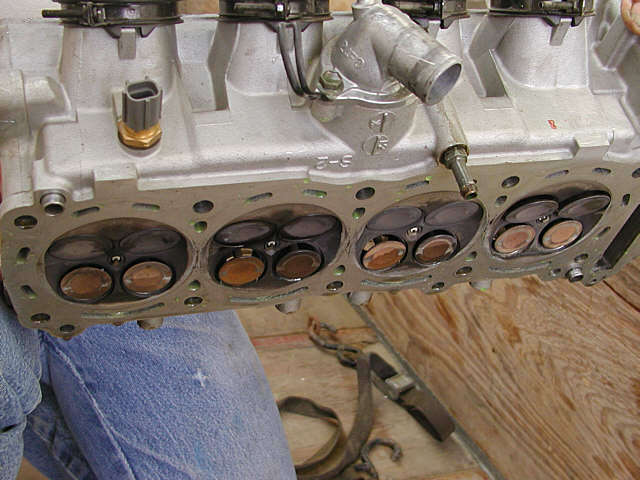 Once the head was off we were relived to see that the head, the pistons, and the block were still intact! Including a new high performance timing chain, 16 valves and assorted gaskets and other parts it looks like we'll get away with less than $1000 in damage. Bent Valves but no major head damage. Late at night on Saturday we started cleaning up our mess. Fortunately we managed to get in the one poor run of 146 Mph which worked out to be enough to finish the season 13th out of more than 250 competitors. This week we pulled the block out of the car and are deciding what exactly to do with it. We have lots of things to do over the winter and many of them require the motor be installed in the car before they can be worked on (like the final air box). I'll keep everyone posted over the winter of the progress. The next newsletter will have some of the photos that other people have taken and sent to us.